The cover story of the July/August 2016 issue of Scientific American Mind was “Banking Against Alzheimer’s.” Of course I’m intrigued by any hope of keeping my brain functioning as well as I can as I move deeper in the third chapter of my life. Most of us do care about the good health of our brains as we age, as friends age, as parents age. The article focuses on the importance of building “cognitive reserve.” The more you have invested in education and learning, the more you have in your brain’s bank as you age and neurons begin to self-prune. But cognitive reserve is not the only factor in preventing, reducing and reversing dementia. I’ve included some of the most important research and the most practical suggestions in the Reflections and Exercises to Practice below. If you read no further than right here – “use it or lose it” – you will have gained something useful from this newsletter. Please do read on for more. * Virtually all brains in old age contain some pathological signs of Alzheimer’s disease, but only some people suffer any symptoms as a result. Those who do not develop dementia appear to have greater cognitive reserve to fall back on. * Choices we make throughout life, from learning a second language or studying music in childhood to finding purpose, can build cognitive reserve and dramatically reduce the risk of developing dementia. * A central theme for maintaining brain health is remaining physically, intellectually and socially active in retirement, all of which are associated with reduced risk of Alzheimer’s. “Cognitive reserve” means the more you require your brain to grow new neurons by learning, the more “surplus” brain cells you have to fall back on as neurons begin to atrophy or die with age and disease. Perhaps one of the most critical steps toward ensuring better brain health is education. Education can help secure brain health as we age, and not just formal schooling, but all kinds of learning. And cognitive reserve does greatly reduce the risk of Alzheimer’s. * Bilingualism seems to delay the onset of dementia by as much as four years. * Learning to play a musical instrument can reduce the risk of Alzheimer’s by 50%. * More education shifts the measurable “change point” of accelerated cognitive decline to later in life. There are also other ways we can coax our brains to grow new brain cells or keep the ones we have. Aerobic exercise, strenuous enough to break a sweat, causes the brain to release BDNF (brain-derived neurotropic factor) the brain’s growth hormone. The brain generates new neurons and stronger connections among the neurons, especially in the hippocampus, the memory center of the brain. 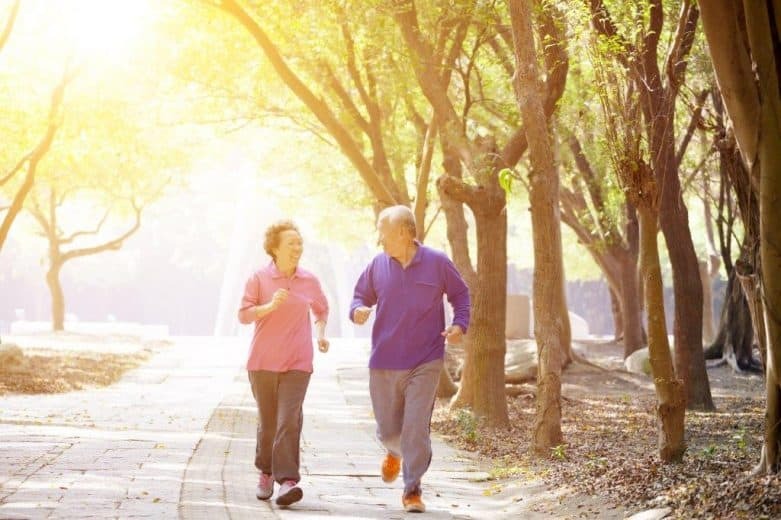 Exercise can reverse memory decline in the elderly; it also helps reverse physical shrinkage of the brain; exercise improves memory and integration of brain functioning overall. Exercise also protects telomeres on the ends of chromosomes (like plastic tabs on ends of shoelaces to keep them from unraveling); telomeres prevent DNA copying errors, which protects us against all disease. And exercise “turns on” genes linked to longevity; in a study of 2400 twins, half active and half sedentary, people who exercised had brains that function as though 10 years younger. The MIND diet (Mediterranean-Intervention for Neurodegenerative Delay) can help slow the build-up of toxic materials that cripple memory and critical thinking, preserve neuronal connections in the brain, and dramatically lower the risk of Alzheimer’s by 53%. The diet focuses on vegetables, especially leafy green vegetables, nuts, berries, beans, whole grains, fish, poultry, olive oil and one glass of red wine/day. The omega-3 fatty acids found in fish, particularly DHA, are arguably the single nutrient most strongly associated with brain health. Brains learn and develop best through interactions with other brains, says Dan Siegel, pioneer in the field of interpersonal neurobiology. Hanging out with healthy brains is one of the most powerful ways we have of keeping our brains healthy. People who have close relatives and friends with whom they can discuss private matters are better able to postpone the symptoms of Alzheimer’s whereas frequent but unsatisfactory interactions with their children increases dementia risk. And subjects who reported more neglect and rejection over 5 years time were more likely to show signs of cognitive impairment. Research subject who score higher on purpose in life show slower rates of cognitive decline and are 2.4 times more likely to avoid Alzheimer’s disease. And subjects who scored in the 90th percentile in conscientiousness – organization, self-discipline, dependability and a drive to achieve – had an 89% reduction in the risk for developing Alzheimer’s. The causes of Alzheimer’s are complex and still somewhat mysterious to the medical establishment. Anything we can do to educate ourselves may help us to implement the lifestyle changes that can keep our brains healthy, build up that cognitive reserve, and postpone the deterioration of brain functioning from aging as long as possible. Please see Exercises to Practice below for specific ideas. And please take good care of your brain as well as your mind and heart. A man should hear a little music, read a little poetry, and see a fine picture every day of his life, in order that worldly cares may not obliterate the sense of the beautiful that God has implanted in the human soul. Retirement without the love of learning is a living burial. Learning a new skill can change hundreds of millions of cortical connections. Just the attempt to learn a [new] language is like running different software through the brain. During the course of researching this newsletter, I saw the film “My Love Affair with the Brain” a wonderful documentary about Dr. Marion Diamond, who taught integrative biology at U.C. Berkeley for 55 years. (She retired at the age of 85.) Dr. Diamond was actually the first neuroanatomist to publish research verifying neuroplasticity in mammalian brains (1964) that triggered the scientific paradigm shift about the human brain being able to change, grow and repair itself lifelong. And plasticity is proving to be an important factor in the brain’s resilience and cognitive reserve. Sharp Again Naturally has produced documentaries of interviews with people who have reversed Alzheimer’s and lecture presentations of the methods used to to so. Here’s the link to a 5-minute clip of people who have “gotten their minds back.” Inspiring, poignant, and an introduction to a paradigm shift about recovering memory and brain functioning. Alzheimer’s now affects one in every nine Americans over age 65; that diagnosis rate is expecting to triple by 2050. Research data is rapidly accumulating that there are clear lifestyle choices we can make from childhood through adulthood into old age that make our brains less vulnerable to the wear and tear of aging. Exercise is essential for brain health. What’s good for the heart is good for the brain. And all movement counts. A poster in my doctor’s office has a photo of a woman walking on a sidewalk down the street carrying a bag of groceries with each arm; the headline is: Life is a gym. Walking up and down stairs, gardening, making the bed, all count. A study was done of hotel maids, who do work hard physically in their jobs every day. Those told that they were getting good exercise scored higher on measures of physical health and well-being than the control group who believed they were just doing their job. I like Christine Carter’s idea of a 3-minute better-than-nothing workout. The idea is to move your body, in any way that feels comfortable and yet energizing to you. It is important to the brain to move your body at least once an hour. It recommended to move your body at least 3 times a week for 20 minutes; 5 times a week for at least 30 minutes is even better. And enjoy your movement/exercise. Exercise has been shown to be as powerful an anti-depressant as Prozac. Let yourself enjoy the dopamine, serotonin and endorphins that exercise releases in the brain. Check out the MIND diet – more green leafy vegetables, other vegetables, nuts, berries, beans, whole grains, fish, poultry, olive oil, red wine. And reduce as much as you can the consumption of red meat, butter, cheese, pastries and sweets, fried or fast foods. Some of these changes in diet may be easier than others, but all of them backed by reliable science. Learning to play a musical instrument or learning to speak a foreign language are the learning activities most often recommended by scientists to preserve brain health. But any learning that stretches the brain to cope with more complexity (not necessarily facts but processes that integrate with each other) can be helpful. Curiosity and playfulness are part of good learning and good brain health, too. People who are active with families, in community, in a social support network, live longer, function better, and are happier. Of course, the benefits of belonging, of having a sense of place in a tribe, are true for human beings lifelong. Choosing to maintain social ties as we age is one of the best protections we have against isolation, loneliness….and cognitive decline. Participate in a workshop, a book club, a choir, a cycling group, a bowling league, a cooking class, a Habitat for Humanity project, whatever suits your interests, your calendar, your budget. And take in the good of feeling cared about by other people. The degree to which a person derives meaning from life experiences helps limit harmful effects of changes in the brain that are associated with Alzheimer’s disease. The benefits of meaning and purpose in life are apparent even when there is evidence of the formation of plaques and tangles that occur in people who develop Alzheimer’s disease. Scientific American Mind magazine is a wonderfully accessible bi-monthly compilation of the latest research in neuroscience and mental health. It’s my favorite magazine of all time; loaded with useful information and stimulating perspectives. Sharp Again Naturally, Preserving Memory, Restoring Minds, provides an entrée to a multi-therapeutic approach to treating and reversing Alzheimer’s disease. Provocative, cutting-edge, informative, potentially life-changing.